A movie with a familiar sounding, learning to be a caring father plot, this one takes on a life of its own involving really cool robots fighting each other in boxing matches. This is a movie that features all kinds of interactions and action with robots that are incredibly cool. When they talk about robots fighting robots, this is the movie. No Transformers or I Robot or anything else. This is it. Robot boxing matches. The action and effects and creativity behind them are all fantastic. Its with the storyline that the movie is somewhat lacking. The story serves as a necklace, threading all of the pieces together, and just following the motions without much thought. As a result, we get a father, Charlie (Hugh Jackman) who makes every mistake imaginable and apparently is always wrong, while his kid is always right. Those elements get tiresome, but the robot fights deliver enough for us to look the other way on the plot problems and appreciate what this movie does have going for it. 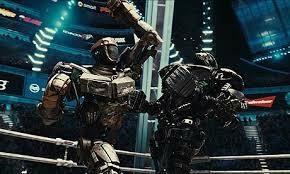 Real Steel is a very cool movie. It’s something different. This is a movie that uses technology and state of the art special effects in ways that many people didn’t realize were even possible. Maybe we should have seen this coming, after three Transformers movies, but who knew that it could ever look this good? In the Transformer films you feel like all you are doing is watching computer effects as they whack at each other over and over again. Real Steel is certainly not that. With these robots, you actually care about them, and in large part that’s because they are more realistic. These machines seem like they could actually function (for example, they have cooling fans installed in their heads.) the effort that was put into designing the robots and making them feel practical, really goes a long way. The story here is about a dead beat dad who gets his son for a few weeks. That has to do with his ex-wife (the boy’s mother,) passing away, and a custody hearing where Charlie negotiates with the boys new step dad to take the kid for a few weeks while the couple goes off on vacation. It’s a tired and clichéd premise, but this movie finds a way to at least make it work long enough to get us to the robot fights. One thing a little different than usual here is that even though this movie does go the route of having Charlie (Hugh Jackman’s) wife die, it’s not as simple as that the son is just his from this point on. Instead, the son, is actually going to the sister of his dead mom. It’s his Aunt Deborah (Hope Davis) and her much older husband, Marvin (James Reborn), who are going to be max’s adoptive parents. And that’s when Charlie finds a way to get some money out of the wealthy couple. The deal is that he has to make it sound like the whole thing, about taking the kid for a few weeks, is his idea. And for that he will be paid a huge sum of money. So of course he agrees. And that’s how we get a movie about a father and son spending a number of weeks together, which is more or less the usual cliche. One thing that does help make this storyline a little easier to swallow is that we don’t meet the kid until we’ve had a nice, long introduction to the characters of the movie. So we feel like the movie isn’t all about the kid story. When we meet Charlie for the first time, he’s sitting in his trailer with his robot, getting ready to bring him out for a bullfight. Charlie is a lousy gambler and he makes bets that he can’t pay out if he loses. Such is the case with that bullfight, where his robot gets destroyed and villain Ricky, (Kevin Durand) wants to collect what Charlie owes him. Only Charlie is long gone by the time Ricky makes it over to where his trailer was parked. That early bull fight scene gave us a nice introduction to these robots and how they fight. I like that the movie got right to the point with showing off the kinds of effects that they planned to feature. And of course, just like the progression of the Iron Msn suit, the different robots keep getting cooler and more advanced. After his first robot is destroyed by the bull, Charlie uses the money he got from Marvin to purchase another robot, which was a former champion back in the day. This robot, known as Noisy Boy, looks like a samurai warrior. He is incredibly cool. Charlie brings him out to a compete in a robot boxing match right away and ends up making some very stupid bets. Even his kid knows better and tries to tell him, only Charlie won’t listen to anyone. And after Noisy Boy is gone, the guys go out to a junkyard and find an older, more broken robot, that they can fix up. This old junkyard robot is actually a sparring bot. It was built to take hits, but not to dish them out. That’s where Charlie comes in. He’s a former boxer, and the robot has a shadow function where it will follow whatever moves someone else is doing. So Charlie “trains,” the robot how to fight, by having the robot follow his moves. It’s actually pretty neat to see. And from here, the robot starts climbing the ladder. He gets more and more fights and continues to excel. Meanwhile the guy Charlie owes money to resurfaces and isn’t too happy. And Aunt Deborah and Marvin come back again too; ready to take Max to live with them. There’s a lot here. The robot matches are obviously the highlight of the film, but then there’s also a huge storyline about Charlie and his relationship with the kid. I like that Charlie never babies Max or treats him like a kid. Hugh Jackman is pretty perfect in this part, playing the same kind of arrogant jerk that he did in his breakout role as Wolverine in the X-Men films. And there’s a good cast backing him up, including Anthony Mackie and Evangeline Lily. This is definitely a fun and cool movie. Much of the premise is cliched, and yet, with this movie, somehow that doesn’t really matter. The boxing robots idea is so fresh and innovative that the movie almost needs a formulaic plot to let us focus on the cool effects and not have to worry about the storyline of the humans. In Transformers, the movies failed because it jammed robots down our throats. 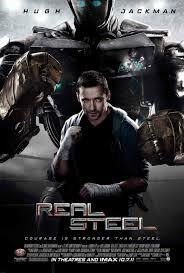 With Real Steel, the effects are so good, that we don’t even want to stay with the humans. And this movie does a nice job of balancing out both. As far as the boxing goes and rising to the top, in many ways this movie does take on a Rocky-like structure. One might even call it Transformers meets Rocky with a little family heart storyline along the way.